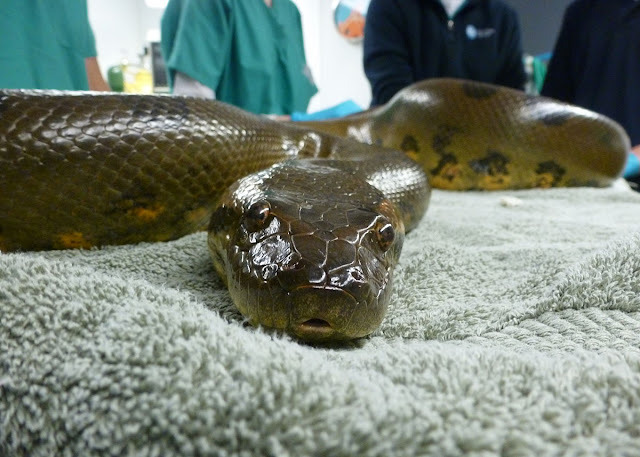 This week, the New England Aquarium pulled the anacondas from one of its Amazon exhibits for their annual physical exams. The largest of them measured in at 14 feet, the other two measured 12 feet 7 inches and 12 feet 4 inches in length. Wilson is the smallest of the group. She weighs only 55 pounds while her tank mates Marion and Kathleen are a more robust 77 and 90 pounds each. Everyone checked out just fine and were returned to their exhibit. Here's a video of their homecoming! Only one r in Marion. I should know. She was named after me.